14 UCW SEPTEMBER 20 - 26, 2017 WWW.UPANDCOMINGWEEKLY.COM The National Association for the Ad- vancement of Colored People presents its 29th Life Membership Banquet Friday, Sept. 23, at 6 p.m. at J. D. Fuller Recreation- al Complex. The theme is "Steadfast and Immovable." The event includes a meal, and entertainment will be provided by Bertha Elliott and her sisters. "This is an annual event and fundraiser that we have each year, and we honor the NA ACP life members that have just received their plaques for the year," Jimmy Buxton, Fayetteville Branch president of the NA ACP, said. "We also like to honor those who are already life members." The keynote speaker is Reverend Cur - tis Gatewood. He is the past director of HKONJ, which stands for Historic Thou- sands on Jones Street. Gatewood has an organization called "Stop Killing Us," which references black people being killed and gunned down by the police. Buxton emphasized that the plight of Black America has gotten worse. "We are now going back into the '60s, and if you take notice, you have an Attorney Gen - eral appointed by 45, whose name I will not say, and has taken the laws that were passed years ago and going back to re- establish those laws to tr y to keep blacks and minorities back," said Buxton. "The most important thing is coming up in 2018, which is the election. If we don't get people out to register and vote the people out who are now making our laws in the state and federal government offices, we will be back to living like the 1950s and 1960s because they are determined to take us back and take this countr y back." The NAACP's office space was destroyed last year by Hurricane Matthew, and the organization lost everything. "We are hop - ing to fill this place up, and it seats 500," said Buxton. "We are starting back new in the office, and we are hoping that we can get as many people to come and buy a ticket and take part (in) this fundraiser." Buxton added that in order to fight against racism, it takes money, and right now is the time for everybody to help keep this fight going. Doors open at 5 p.m. 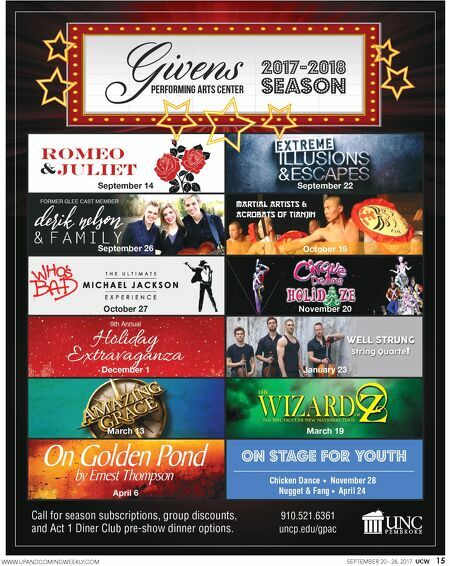 Ticket cost is $45 for adults and $25 for youth ages 17 and under. For more information, call (910) 484-6166. 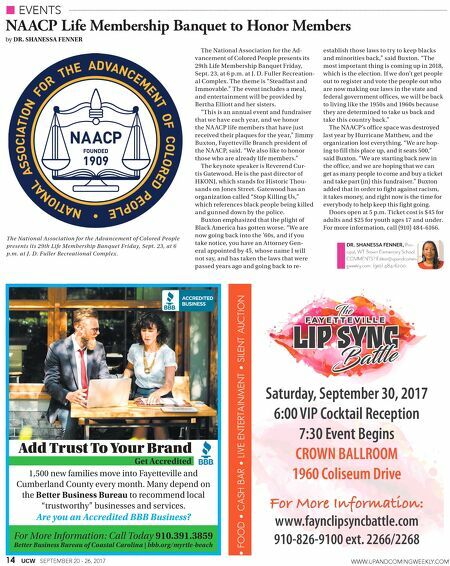 NAACP Life Membership Banquet to Honor Members by DR. SHANESSA FENNER EVENTS DR. SHANESSA FENNER, Prin- cipal, WT Brown Elementary School. COMMENTS? Editor@upandcomin- gweekly.com. (910) 484-6200. The Nat ional Associat ion for the Advancement of Colored People present s it s 29th Life Membership Banquet Frid ay, Sept . 2 3, at 6 p.m . at J. D. Fuller Recreat ional Complex . For More Information: Call Today 910.391.3859 Better Business Bureau of Coastal Carolina | bbb.org/myrtle-beach Add Trust To Your Brand Get Accredited 1,500 new families move into Fayetteville and Cumberland County every month. Many depend on the Better Business Bureau to recommend local "trustworthy" businesses and services. Are you an Accredited BBB Business?